Open up your home with new bifold doors. A great way to bring your living space and garden together. 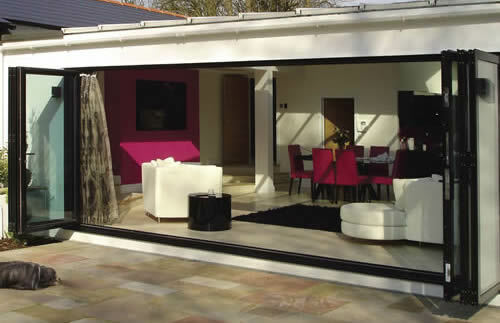 Our bifold doors slide and fold away effortlessly creating a space to relax in the summer, while in the winter months high quality seals and gaskets keep the warmth in your home. Slim sight lines allow you to make the most of your view. Easy Glide stainless steel wheels. Extends you living area on to your decking or patio. Choice from two to seven panels depending on size. Brings the great outdoors in. Our doors meet the 1.8W/m2/K U Value required.